Isn't it time to start building your own future? The only way to guarantee your future is with a business of your own. 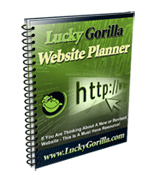 Lucky Gorilla needs people just like you - people with a passion, people that will accept nothing less than success. According to Fortune Magazine, a record number of Americans went into business for themselves last year. Is this going to be the year when you finally join this entrepreneurial wave? It's easy with a Lucky Gorilla franchise. You can even start part-time. It is important to understand that you won't be fixing computers - we will show you how to hire people to do that. Your job is to build and manage the business and we will guide you step-by-step. Don't let this opportunity pass you by. A Lucky Gorilla franchise is like no other! Simply put...this is a home-based computer repair franchise that really rocks! If you want to get more information, all you need to do is fill out the form below. We'll contact you and help you decide if a Lucky Gorilla franchise might be the right choice for you.